Sue’s Tech Kitchen is a tech-fueled wonderland for the mouth and the mind. 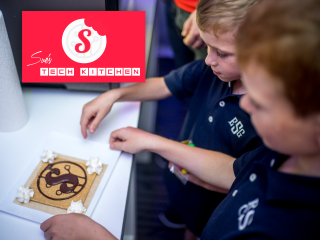 Envisioned by bestselling author and serial entrepreneur Randi Zuckerberg, designed by a NASA scientist, and featuring technologies from all corners of the modern imagination, Sue's Tech Kitchen offers a STEM-inspired adventure for the whole family that empowers kids to engage with tomorrow’s technologies and revolutionizes family dining in the process. Visitors of all ages can enjoy 3D-printed s'mores, robots controlled by candy, edible chemistry experiments, treat-dropping drones, and more.